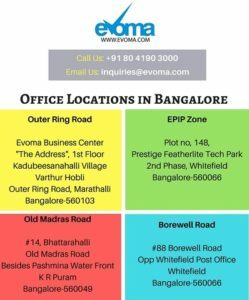 We work with hundreds of startups, SMEs and consultants who are located at Evoma’s business centers across Bangalore, mentoring them, helping them raise funding, providing food and beverages, connections to buyers, various business support services, meeting and conference rooms, board rooms, reception desk, lounge for meeting clients, and…office space. There’s a reason office space is mentioned last – startups looking for office space aren’t really looking for space. What they really need is growth and success, which translates into operational support, services, connections and people who will propel them forward towards these goals. Let’s start this on a broad note. Why Bangalore? On the list of world’s 20 best startup ecosystems. Startup ecoystem valued at $19 billion. 45 percent of Bangalore startup founders have at least 2 years of work experience in a startup. Now that we’re clear about why you want your startup to be located in Bangalore, let’s move forward to where in Bangalore. Take a look at our research data on the cost of office space in different areas across the city. You can go straight to the cheapest areas, but is that going to help your startup or SME succeed and grow? If you move into a shop or commercial space which is not open after 10 pm, are you going to be able to do all the work you need to do? If there’s no food and drinks in the building or restaurants nearby, will you be wasting a couple of hours for lunch every day? Are you comfortable calling your clients to your office for a meeting? There are many such questions that all add up into one result – your startup succeeds and grows in a good location where you have all these facilities.